This high-performance module delivers 50 dB of gain over the broad range of 1 GHz to 3 GHz with a noise figure of less than 2 dB and OIP3 of +33 dBm. The HILNA LS is also usable from 500 MHz to 3.75 GHz with 40 dB of gain (typical). 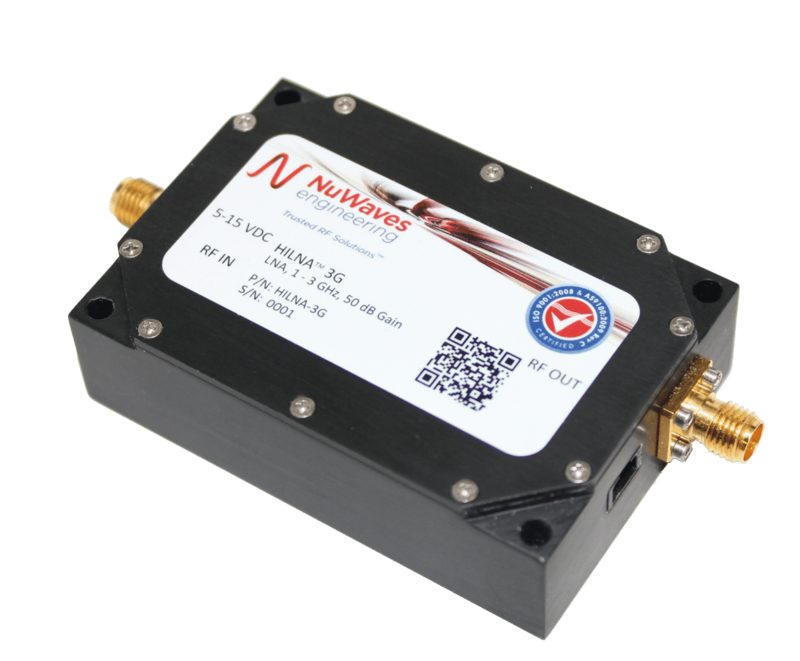 NuWaves’ HILNA LS™ is a broadband low noise amplifier covering L- & S-bands, and designed to achieve extremely high gain while maintaining low noise and a high third order intercept point. The HILNA LS’s small form factor (3.3 inches cubed ) makes it ideal for small communication system installations, co-located to the antenna. The HILNA LS also offers a factory configurable Bias-T option, eliminating the need for a separate power cable run. HILNA LS’s robust power supply also operates over a very broad range, easily allowing the unit to be integrated into systems without regard to power supply precision.